Over the course of the last several years, I’ve had the opportunity to shoot a number of amazing cars and cool drivers. There are a couple who really stand out – one of whom is currently recovering from a broken hip after a nasty accident drifting last week (Joe Tardiff, aka @Trailer_Joe on Instagram) – but I’m sure he’ll be back out on the track in no time with his trademark smile and attitude. Another driver who impresses the hell out of me time and time again is Dominic Martinez. 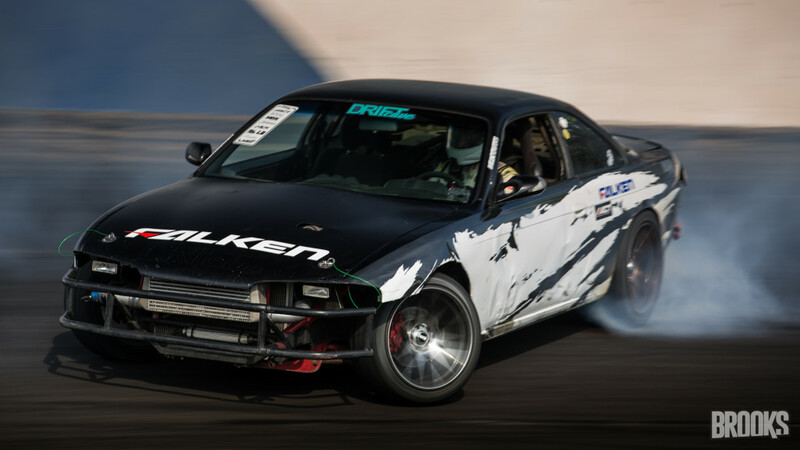 This kid has been driving for just ONE YEAR, and his dad – Eric, has handed over the keys to his Pro-Am drift car to allow Dom to follow his dreams. Dom has proven himself in terms of driving skill, ability to react quickly and appropriately in sketchy situations, and his ability to maintain a positive, professional demeanor and presence. All of that is great – and may not stand out a ton on it’s own… BUT .. when you consider that Dom is just 13 years old – that changes things. This kid has a gift. 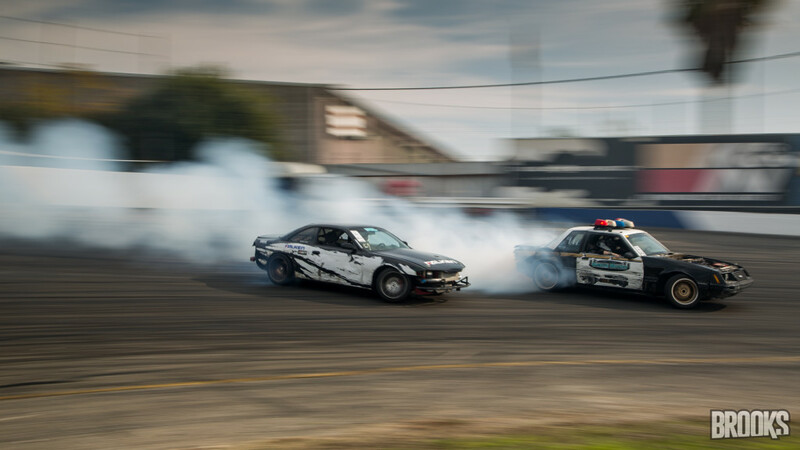 His talent has not gone unrecognized – he’s been fortunate enough to get hooked up with Formula Drift Pro driver and the man behind Drift Cave – Matt Field, who has taken Dom under his wing and provided him with mentoring and coaching – not just on the track, but off the track as well. Additionally, with the support of Drift Cave Motorsports, Dom has a solid support team to help him refine his skills and learn the sport. Many people in the Northern CA drift scene are aware of Dom, and the fact that he’s doing such an amazing job, but despite the fact that he has proven himself on a number of local skid pad events, he was still limited in terms of what events he could participate in due to his age (understandably). 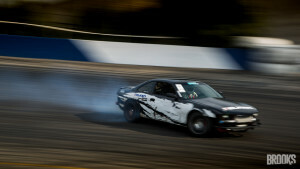 Specifically, he wanted to enter into the Pro-Am circuit – but Formula Drift (the sanctioning body behind the Pro-Am series) states that drivers must be at least 16 years of age. Throughout this year, I’ve captured thousands of photos of Dom racing at various events in Stockton, Willows and Sonoma, as well as numerous video clips, all showing his aptitude behind the wheel – so when Matt Field from Drift Cave contacted me and asked if I’d be willing to provide some content to help with the proposal to Formula Drift, requesting that they allow Dom to drive – I was happy to oblige. That was just a couple months ago – and things obviously worked out. 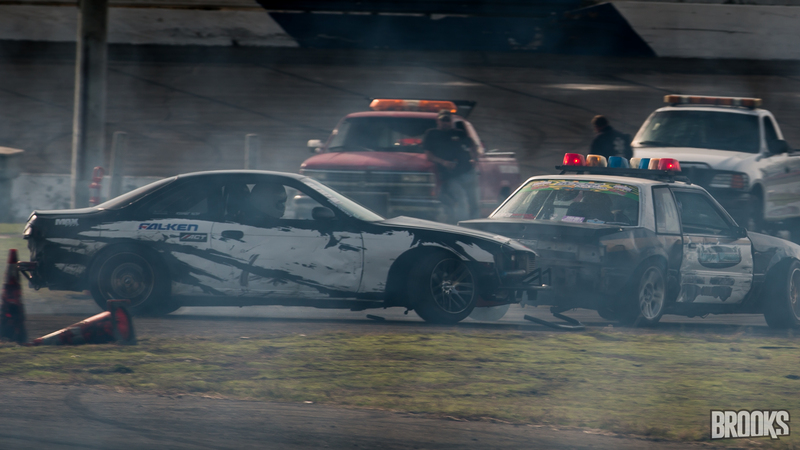 The news broke about a week ago, and Matt Field posted it on his Facebook page – an article from Wrecked Mag announcing that Dom would be competing in the Golden Gate Drift Series. Dom was able to participate in his first Pro-Am event this past weekend at Thunderhill Raceway in Willows, CA. A great track for drifting, with some nice tight technical turns as well as nice sweepers too. 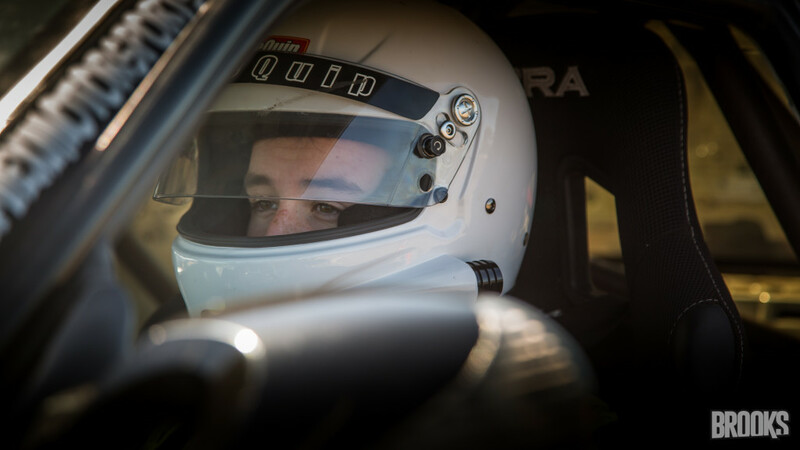 He ended up having a successful outing for his first official Pro-Am event – Dominic qualified 9th out of 16 drivers. He had some issues with fluctuating fuel pressure from the end of practice through qualifying resulting in some inconsistency in how the car drove. He went up against Joe Freeman in the top 16. The battle was fierce, resulting in 2 “One More Time” runs, his crew resolved the fuel problem for the 3rd OMT and Dom won that battle. In the next battle (Top 8), Dom battled Travis Ragona. Dom chased first and had a strong chase run with great proximity exiting the course. On Dom’s lead run he dropped a tire in the dirt causing him to spin, giving Travis the win. Travis end up taking 3rd place for the day. Dom and his dad Eric packed up the car – but they weren’t done for the weekend. 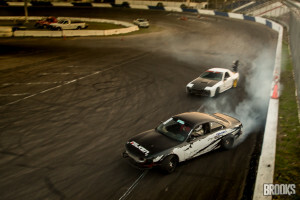 They went on to go to an event at Stockton 99 Speedway – the final round of Boost Drift Series. 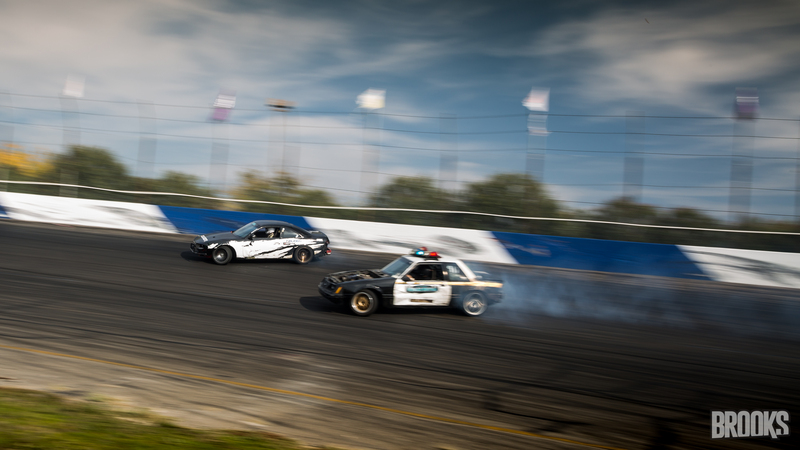 This is a grass roots series that is often held at the San Joaquin County Fairgrounds parking lot, and gives many new drivers an opportunity to hone their skills and learn the sport. Driving at the speedway however, is a slightly different beast – the banks and walls have been known to chew up cars (including FD driver Matt Coffman’s car last year) without prejudice. The day started as most comp days – with the first part of the day being practice runs – Dom came out and made a strong showing, had some solid leads and follow runs, playing it conservatively with the wall, but progressively getting closer throughout the morning. Around noon, there was a little bit of contact with another driver – Andrew Maglaya (who went on to win the Boost Series Season, 1st place! ), and then a subsequent interaction with a pothole on the track. Between these two incidents, the front subframe was weakened, causing the steering rack to become problematic. Dom thought he was done for the day. As is the case in the local drift scene here in Northern CA, these guys help each other out quite a bit. 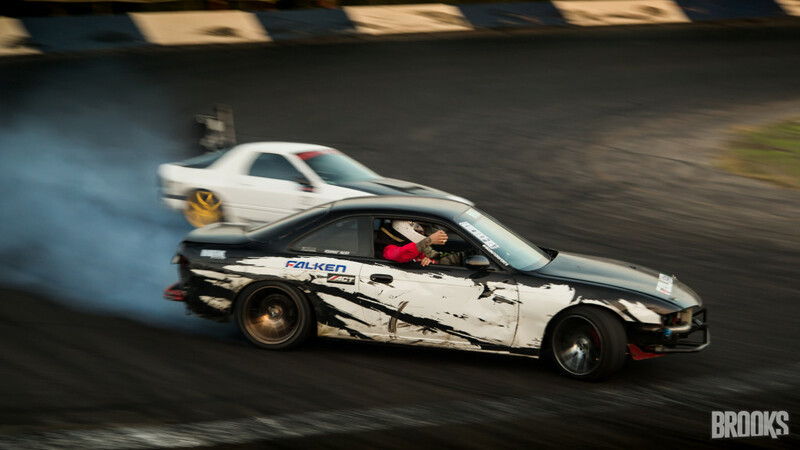 Within a little while, Joe Freeman (the same Joe Freeman Dom had battled and knocked out of the running the day before at Golden Gate Drift) helped out with some on the spot welding, and got Dom back on the track. Dom continued with practice and had some solid runs. When it was time for the drivers meeting before qualifying and competition – the organizer (Rob Pascua) had to inform all the drivers that Dom was now competing in Pro-Am, and as the rules for Boost Series indicate – Pro Am drivers are not allowed to compete in Boost – UNLESS the drivers agree. So, they agreed to hold a vote, which would be “majority rules”, to see if they wanted to allow Dom to compete with them in their series on Sunday. The vote ended up being a “no”, but in typical Dom fashion, he handled it like a pro, with a smile. He was gracious for the opportunity to drive on the track with his friends and get some good seat time. At the end of the day, Dom did get to go back on the track for some exhibition runs – with none other than Joe Freeman. Having been around Dom and Eric at a number of events, I’m always impressed with the amazing bond, and incredible level of support Eric has for Dom – it’s inspiring. I can’t wait to see what this kid ends up doing – he’s got a bright future ahead of him, and sponsors will likely be lining up at his doorstep in a short time. 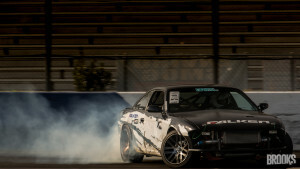 Be sure to follow Dominic on Instagram – https://www.instagram.com/dominicmartinezdrifting/ .. don’t take your eyes off this kid – he’s moving fast. Also keep an eye on my Facebook Page and Instagram Feed for more photos of Dom! 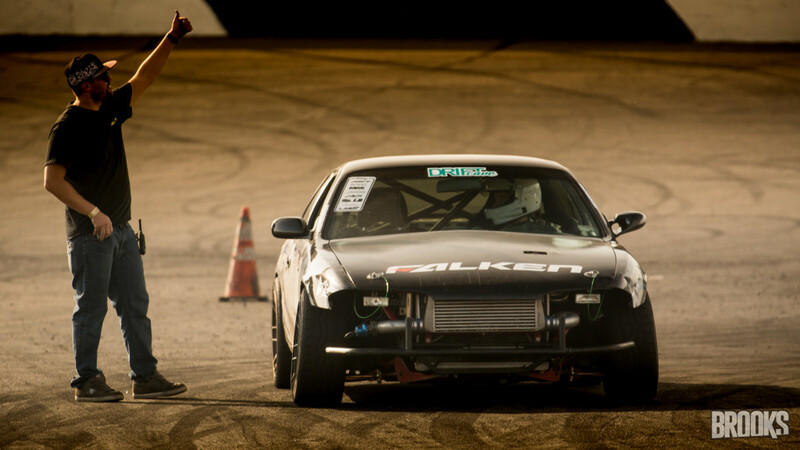 This entry was posted in automotive photography, Cars, drifting, motorsports, race and tagged drift, drifting, motorsports, photography, race by calgecko. Bookmark the permalink. I had the pleasure of spending Saturday at Goldengate draft with Eric and Dom not only is Dominic a stunning driver but as you said I left the track feeling like everyone there was so sweet and supportive and such a great family !! Thanks for a great article. My grandson is very special indeed!